Vermilion Jelly is one of the newest health supplement in jelly form. Who is Vermilion and how it all started? 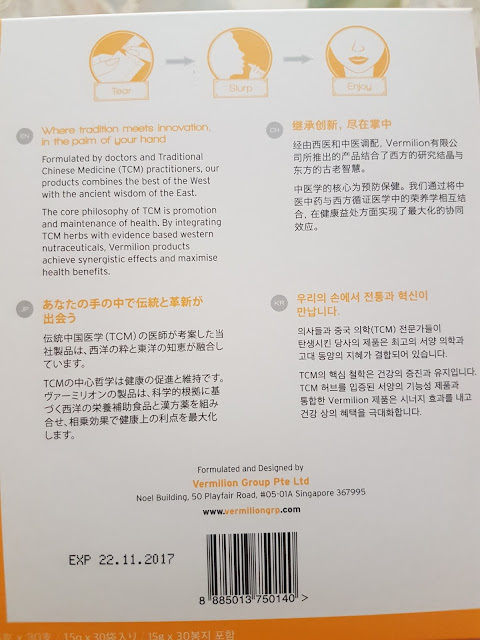 Vermilion Group is a Singapore based company dealing with preventative health, anti -ageing medicine and health products which combines the best of Evidence Based Western medicine with Traditional Chinese Medicine. Vermilion Group has 3 founders. Dr David Wen and Dr Lim Chong Han were classmates during their University days. With their keen entrepreneurial instincts, they pioneered the Singapore Student Association in Adelaide University which eventually grew and became the backbone of all Singapore Student Associations throughout South Australia’s Universities even until today. One fine day in 2014, the duo decided to come together again to have a start-up business – A Functional Health Food Business with a twist unlike others in the market, a mixture of both east and west medicine. That was how the bother of Dr Lim Chong Han, Mr Lim Chong Wee who practices Traditional Chinese Medicine (TCM) came into the picture. The trio wanted to innovate the way supplements are taken. “We wanted something interesting, something that both the young and old could enjoy, rather than complaining and gulping down gallons of water to make that pill go down.” Hence, what do Singaporeans enjoy the most? That’s right! To munch and to try out new stuffs. 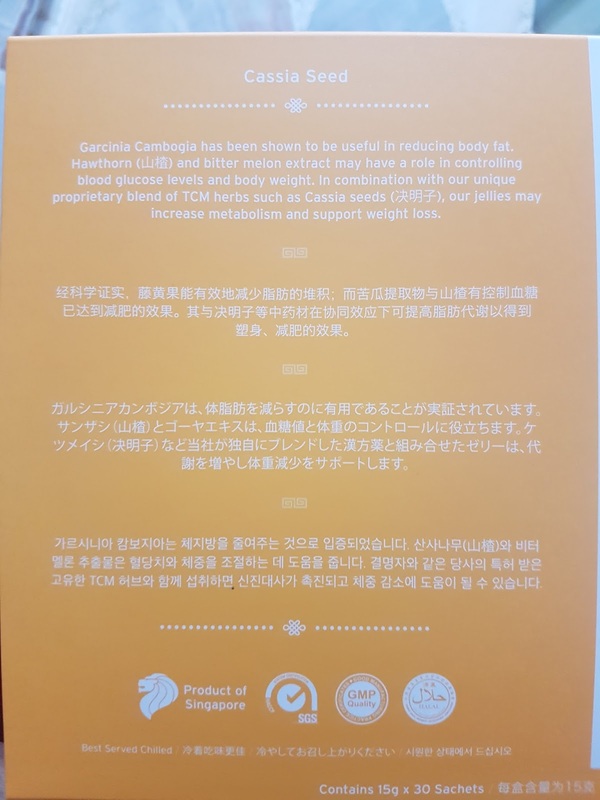 Hence the trio came up with this innovated jelly supplements which gives the same benefit as a pill and on top of that, where side-effects are taken care of by the holistic protection from Traditional Chinese Medicine (TCM). As such these innovated jelly strips confer the consumers the best of both worlds. Interestingly, it was the mums and grandmas of the trio that sparked the idea of having an east meet west fusion style “munch-able” health supplements as they are always complaining about the number of pills they always have to take every day which they deem as undesirable because of “side-effects”; unlike TCM which is seen as more natural and organic and deem more beneficial for humans. The downside of TCM however is the hassle in preparation. 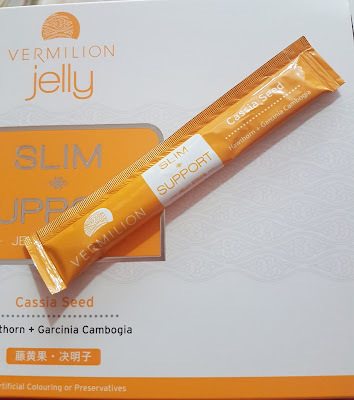 Thus Vermilion Jelly, a health supplement which confers all the benefits as a pill with a touch of modern researched TCM that can be eaten for enjoyment is born. Crafted with quality ingredients, Vermilion jelly strips are an ideal solution for consumers tired of daily pill-popping and grousing about the number of supplement tablets they have to take. Fun and tasty, the jelly strips are a refreshing way to get our health fix anytime on the go, and appeal to both the young and old. Noting that younger consumers are becoming more health-conscious and taking dietary supplements, Vermilion’s founders are confident that this avant-garde form of nutrient strips will spur more interest in health supplements by catering to the modern lifestyle. The jelly strips suit those with active and busy lifestyles, packing a punch in one compact and light sachet that can be stashed in the pocket. Vermilion Jelly comes in a variety of flavours with nutrients for different purposes (see Appendix). Fans of Traditional Chinese Medicine will be pleased to know that the unique products combine evidence-based Western nutraceuticals with old school TCM, maximizing efficacy. For young consumers unfamiliar with TCM herbs, the jelly strips’ hip and vibrant packaging help to promote awareness of traditional ingredients such as goji berry and ginseng. Vermilion Jelly is halal certified. The products are manufactured under stringent laboratory conditions and do not contain any artificial colors or additives, utilizing natural fruit juices, teas and flavours instead for their great taste. Currently, there is no east-west combine health supplement snacks in the Singapore market. The founders will be working towards creating more palatable health supplements such as chocolates, beverages, cookies etc. I was given the slimming range to try. It comes in a box with 30 stripes of Jelly. From 29th-30th July 2017,all jellies are at 30% - 50% discount. 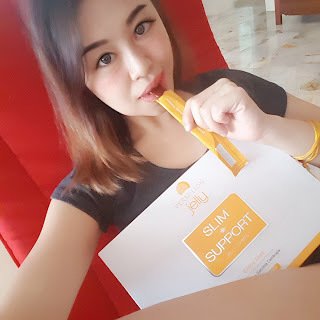 and the Slim Support Jelly at buy 1 get 1 free! They have lots of range for the jelly from Slimming, health and vitality, digestive to eye care. Do keep a look out on my Instagram as I will be posting my reviews there! Where to purchase or find out more about them? 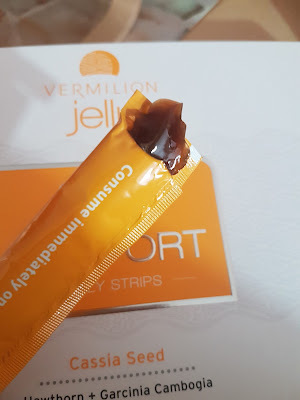 Disclaimer: Vermilion Jelly was provided for personal review purposes only. All reviews are 100% honest and based on my personal experience. No monetary compensation of any kind was given or received for this review. Is it nice? I mean the taste. I have tried several and many taste I couldn't accept. Yes this is really so good I swear! I think it's because the Hawthorn makes it tastier. Wow! First time c this kind of product.. Looks nice, the jelly... The function is cool..
Thats look yummy and cool. Great benefit too. It's yummy most importantly is the benefit which I really are attracted to! It is interesting when the product came in jelly form. We are too comman with the liquid form of supplement, anyway this look cool. I agreed with that. This is really convenient too and won't cause much mess! I am interested to this ! Hmm..will they ship to Malaysia? You made me really interested in this product.. wish to get them for myself.. Very interesting. Would they shipped like in the Philippines. This jelly is so new to me but it looks so effective and convenient. Would love to give it a try soon.